Ivy Avenue Press, Port Dover, Canada. 123pp. Journalist/blogger Donna Laframboise’s first climate book was The Delinquent Teenager, exposing in late 2011 the multiple flaws in the structure, personnel and processes of the Intergovernmental Panel on Climate Change (IPPC). She has now followed through with Into the Dustbin, a compendium of about 80 of her essays over the past few years, all chipping away at the IPCC’s and its people’s credibility. 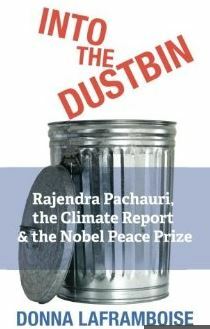 The book has two themes: the stained integrity of IPCC chair Rajendra Pachauri and the rush by IPCC scholars to drape themselves in wholly fictitious personal glory as “Nobel Prize” science winners. In fact, the IPCC, not its members, won half of a “Nobel Peace Prize” in 2007 merely for raising awareness of climate change and its purported remedies. While much of Into the Dustbin‘s material originated in her blog posts, the essays are now tidied and parceled up in a reader-friendly way. She shows how Dr Pachauri has made an art form of mis-describing the IPCC as an objective, science-based, policy-neutral institution. Laframboise ruthlessly catalogues examples of the IPCC’s activist bent and ethical and professional, shortcomings. This is the same Pachauri who abused an eminent Indian glaciologist, Vijay Raina, for practising “voodoo” and “magical” science, and for indefensibly questioning the IPCC’s credibility. In fact, Raina had drawn attention to the IPCC’s 2007 howlers about Himalayan glaciers melting by 2035. Later the IPCC had to publish nine separate erratas to that single page of 497 words on glacier melt. Laframboise tirelessly demonstrates that Pachauri and his institution are intricately connected with the green warriors of Greenpeace, WWF, Worldwatch and a host of other activist groups. She remains incredulous that Pachauri should flaunt rather than downplay these connections. He has even written effusive forewards to two Greenpeace tracts. His self-described agenda is to transform the world to a new value system aligned to the green agenda, and coupled with massive wealth transfer from the West to the Third World, including India. This agenda-setting could be fine for a political party or lobby group, but Pachauri’s IPCC is meant to be objectively evaluating research on the difficult and complex issue of human-caused global warming. As Laframboise says, you wouldn’t expect a judge in a murder trial to go lunching with Crown prosecutor or the accused’s barrister. As she says, it’s not as though Pachauri is some minor celebrity with a penchant for gaffes. He runs the IPCC. The IPCC’s findings, valid or not, are convulsing modern industrial society. IPCC reports are attempting to steer the world’s economy – especially the West’s – to a lower energy, lower-growth trajectory, reducing the living standards of billions in the course of allegedly ‘saving the planet’. Australia’s Labor government, ousted in September this year, bet the ranch on the IPCC’s veracity. Laframboise provides some insights into how the IPCC, riddled as it is with conflicts of interests and flawed processes, has sailed on almost immune to criticism from the mainstream opinion-leaders. She notes that Iceland, Greece and Ireland all embarked on a course of financial profligacy that was manifestly heading for ruination. No voices cried: “Halt! This is madness!” apart from a few isolates who were speedily marginalised in the media and in the counsels of the wise. In Iceland’s case, the banking losses amounted to $330,000 for every man, woman and child in the country. On a larger scale, the Great Financial Crisis was also the product of mass irrationality. For those who have fully absorbed her anatomising of the IPCC in The Delinquent Teenager, this latest book will cover familiar ground. There’s the elucidation of how the IPCC breaks its own rules at will; how activists have infiltrated its author and lead-author ranks, and how its supposedly gold-standard science is sometimes the effusions of young students still to earn their Master’s, let alone Ph.D., degree. We are again walked through the UN shenannigans requiring the reservation of cushy spots on IPCC scientific panels for Third World and female scientists. Her essays tease out the critiques of Pachauri and the IPCC — not from its enemies but from its friends such as the InterAcademy Council and the IPCC’s own inside team. This new book is easy to dip into and enlivened by many nuggets and comments not found in Delinquent Teenager. With the fifth IPCC report imminent, Into the Dustbin ought to function as a vaccination for all my fellow journalists against delusions about IPCC integrity and Pachauri’s credibility. I fear, though, that the credulity of my profession will continue undiminished.